"The Trial of Krang, Part One"
Planet Neutrino, Smada City, the Kah Lil High Security Prison. General Krang is in his cell whining to his attorney that the entire trial he's about to be subjected to is a farce, insisting he only did what he did for the survival of the Utrom race. His appointed defender has little hope in winning the case, but after he leaves, Krang calls his associate to come out. Hakk-R slithers out of an air vent and Krang slips him a device. He tells him to use it in conjunction with the witness IDs he stole from the Fugitoid to make sure he wins his trial. Earth, the lair. The Turtles and the Fugitoid are met by Commander Dask who teleports them back to Smada City on Planet Neutrino so they can help with the case against Krang. Upon arrival, they're met by Zak, Kala and... Leatherhead? Evidently, Leatherhead was "subpoenaed" to act as a witness in Krang's trial and will gladly testify against his former captor. The Turtles are then brought to a ceremony where King Zenter, Queen Gizzla and Princess Trib present them with medals recognizing their participation in the Krang War. Later, the Turtles and Leatherhead are brought to the war room for a briefing with King Zenter. Zenter explains that since Krang was captured, Maligna and her Malignoid forces have tried to fill his power vacuum. Unfortunately, he cannot focus on stopping them until the trial is concluded and Krang is dealt with for good. Appa of the prosecution team then enters and unloads some bad news. When Utrominon was destroyed, most of the evidence of Krang's evildoing was lost with it. The five witnesses the Fugitoid had mentioned are more vital than ever in sealing the case against Krang. Suddenly, a tentacle slithers out from under a table and injects Appa with a poison that kills him on the spot. The assassin reveals himself to be Hakk-R, and after a brief skirmish with the Turtles, Leatherhead and the Neutrino Commandos, he teleports away. The Fugitoid, having had the most contact with Krang, is then forced to fill Appa's shoes on the prosecution team. The Turtles, Zak and Kala then leave aboard a Neutrino Starmobile to gather up the witnesses before Hakk-R can get them (while Dask stays behind to watch Leatherhead). *This story is continued from TMNT (IDW) #72. 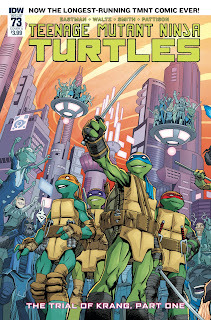 The story continues in TMNT (IDW) #74. *Hakk-R stole the witness data from the Fugitoid in the 2017 Free Comic Book Day special TMNT: Prelude to Dimension X, which occurs just before this issue. *TMNT: Dimension X #1 and the rest of that miniseries take place between this and next issue. 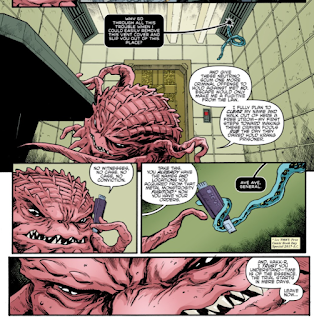 *General Krang was captured by the Neutrinos in TMNT (IDW) #44. 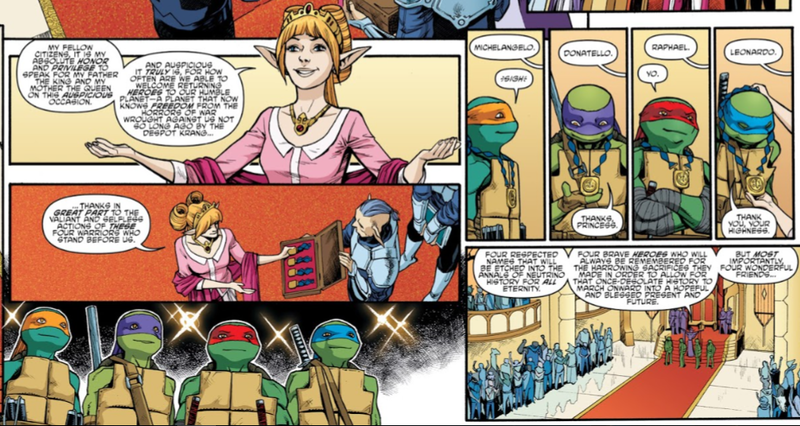 *The Neutrino royal family last appeared in TMNT (IDW) #20. *Leatherhead decapitated the Fugitoid and slaughtered numerous Utroms in TMNT (IDW) #56. 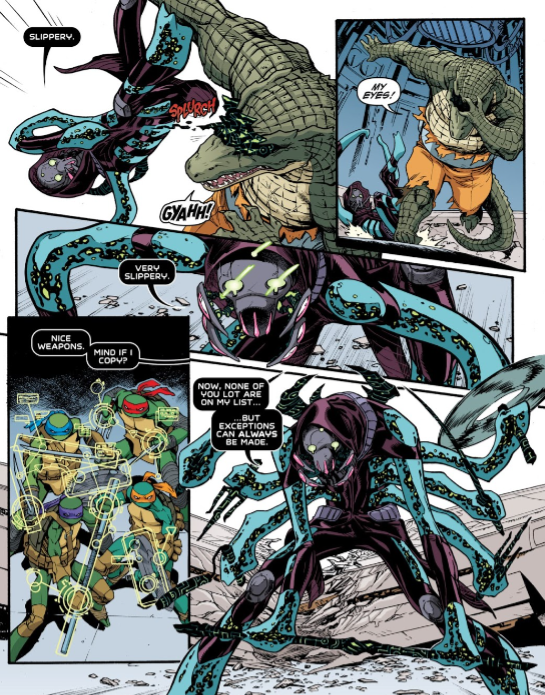 He escaped the Utroms in TMNT (IDW) #58 and last appeared in TMNT Universe #5. *The last days of Utrominon were seen in TMNT: Utrom Empire #3. *Hate to be a Debbie Downer, but the cover blurb promoting this issue as "The longest-running TMNT comic ever" is a bit of a premature celebration. While the IDW run has now eclipsed the Archie run, which ended at issue 72, the Fleetway comic actually ran for 75 numbered issues and 84 total issues (the numbering was dropped but the series continued without it for some reason). 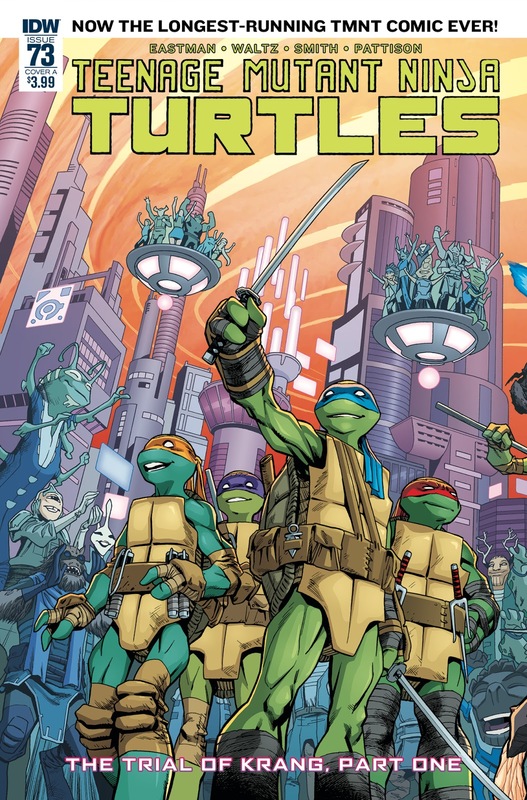 *That said, it IS the longest-running TMNT comic to actually use the word "Ninja" in the title (since the Fleetway comic was technically Teenage Mutant HERO Turtles), so I guess they're right in that regard. *This issue was originally published with 6 variant covers: Cover A by Cory Smith and Ronda Pattison, Cover B by Kevin Eastman and Tomi Varga, Retailer Incentive Cover by Julio Das Pastoras, Comics & Ponies Exclusive Cover by Kevin Eastman, TMNT-ninjaturtles.com Exclusive Cover by Jim Lawson, and Yesteryear Exclusive Cover featuring FunkoPop Shredder photo. You know what I rarely compliment IDW's TMNT book on? Having enough dialogue and text to make me feel like I'm getting my money's worth. It isn't overburdened with purple prose, like a Chris Claremont book, but there's enough of it in these comics to keep me from breezing through the things in 5 minutes and wondering where my $3.99 went. And the dialogue is colorful enough that it gives the characters personality and charm, too. Hey, it may not sound like a big deal, but with comics costing as much as they do, I value a book that actually expects me to READ it and spend some time on it. Anyhow, "The Trial of Krang" is underway and it feels like forever since we last heard from him (just over 2 years). While I didn't miss him while he was gone so much, mostly because his arc was very nicely sewn up during "Attack on Technodrome", I am happy to be catching up with him again after an extended break. The actual "trial" aspect of this storyline presents an interesting followup; in hero vs. villain comics, you usually expect the bad guys to be plopped in prison once they're caught and that's the end of that. But this storyline reminds us that due process is a thing (even in Dimension X) and Krang gets his day in court. He's not done yet. While Krang hasn't been heard from in two years, the Neutrino characters haven't been seen in FOUR years. I had completely forgotten about Mike's crush on Trib. Waltz stirs the embers of that forgotten romance a bit, with Trib giving Mikey a special welcome after the ceremony, intimating a mutual attraction. I wouldn't get too attached, though; Mikey's gonna have to go back to Earth when this storyline is over, after all. The Neutrino Commandos feel a bit more distinguished in character than I recall them. Dask is the serious-minded leader, Zak is the catchphrase-spewing cool guy (who acts most like the Fred Wolf era Neutrinos), and Kala is... the girl. Okay, so she still needs some work, but the characters do pop a bit more this time around than they did four years ago. Chalk that up to the writers having a near half-decade of extra experience under their belts now as opposed to then. This entire "Trial of Krang" is perhaps a bit fragmented in delivery. I hope you got that Free Comic Book Day special back in May, because it's what sets everything up. And before you read Parts 2 and 3, you've got to check out the whole 5-part Dimension X miniseries (which looks to be good). I can see the convoluted release potentially scaring off some new readers, but the bright side is that those awesome hard cover IDW Collections will print everything in proper reading order, so it won't be an issue in a year or two. The Princess reminds me of Princess Zelda. I wonder if IDW likes to place small references like that. I have actually seen Mario brothers, Animaniacs, and other characters be referenced in other brand comics and it always gives me a smile. Once again, two years since we have seen Krang!!?? It still feels like yesterday that IDW started to churn out these awesome Turtle comics. Seeing them treat the readers as mature beings and continue the legal side of Krang's trial (as you mentioned) reminds me of why I respect IDW. I hate when media producers just leave things as, "It all worked out in the end." I want to see what happens to the characters and how they feel and what they do next. I am sure we will get a nice story line with Krang's trial. I wonder if it will end up similar to Che'rell's sentence or if they will actually push for a death penalty? Assuming that there will be a trial after Krang tries to escape. Maybe I'm just seeing things that aren't there, but that purple fairy at the ceremony reminds me of the fairy girl from the OVA. This arc has a really weird set up to it. In Prelude To Dimension X, it ended with the Turtles vowing to follow Hakk-R into Dimension X in order to protect the witnesses. The Turtles have their weapons out and a look of determination on their faces, ready to go into battle right there. I thought that was going to segue into them going right to hunt for those witnesses, to be shown in TMNT: Dimension X. Instead, they put their weapons away and attended their own award ceremony. Don't they have every reason to believe that Hakk-R is out there, slaughtering the witnesses while they receive medals and Mike makes googly eyes with Princess Trib? And then they go back and are reminded again how supremely important these witnesses are, before Hakk-R attacks again and the Turtles chase after him (leading to the hunt for the witnesses, again in TMNT: Dimension X). It seems like they forgot about Prelude To Dimension X when they wrote this story. From the description of the story, it feels like we're just getting the redo of the setup. Am I completely missing something here? Am I also the only one who thought that Prelude To Dimension X would segue right into TMNT: Dimension X, and then that go into Trial Of Krang? I was hoping that, rather than an action packed setup to a separate miniseries, that Trial Of Krang would actually be an ethical discussion (via the trial itself) into the morality of Krang's actions (committing genocide, but doing so to save his people). The trial could have gone back and forth with both condemning Krang's actions and defending Krang's actions, with neither side of the trial presented as the "right" or the "wrong" side to be rooting for (until the end where Krang gets convicted). I dunno, I would have liked that. I guess that wouldn't be "fun" enough for a Teenage Mutant Ninja Turtles comic, having three issues just being an analysis of the ethics of wiping out one species to ensure the survival of another told entirely through a war crimes trial. "Zak is the serious-minded leader, Dask is the catchphrase-spewing cool guy (who acts most like the Fred Wolf era Neutrinos), and Kala is... the girl." I'll have to go back and check, but I seem to remember the comic playing up Zak as the "catchphrase-spewing cool guy" (wasn't he the one who palled around with Raphael?) and Dask as the "serious-minded leader" (wasn't he the one who was constantly on monitor duty for the royal family?). I've never had an easy time telling Neutrinos apart in any continuity (except for Kala because... "the girl"), but I agree that their personalities seem more developed in this issue than what we've seen previously. Whoops; got their names mixed up in the article. Fixed! As you mention, Krang's conviction is a foregone conclusion. That plot line ends up on a listicle of creative misdirections as "Remember that one time the Turtles briefly tried to tell us genocide was okay in some circumstances?" Despite being fertile ground for some different story telling, the optics of it don't fly. The way the story is now creates more uncertainty and tension. I have no idea if Krang will end up escaping or not. Krang's fate might be similar to Archie where they exiled him to a toxic waste planet Morbus, or Ch'rell's in 4kids where they initially banished him to an ice asteroid where he froze until Turtles Forever brought him back. Or Fred Wolf Krang who was apparently banished from the Nick dimension by Kraang subprime to the Fred Wolf Dimension X, and then banished from there to Earth. Krang and his kind have a long history of being banished/exiled to places rather than outright killed. Since IDW is probably reluctant to outright have Krang sentenced to death, I predict they will banish him somewhere.